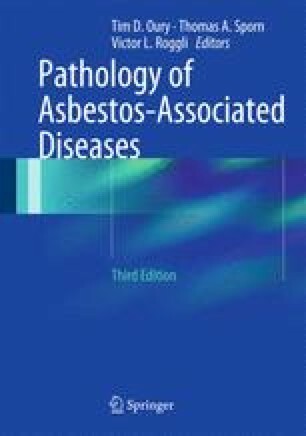 While the carcinogenic effect of asbestos in the etiology of mesothelioma and lung cancer is widely accepted today (see Chaps. 5 and 7), conflicting opinion exists for cancer of other sites. This is partly because of the fact that methodological limitations and weaknesses may be found in most of the studies reported in the literature. Some epidemiologic studies have suggested a relationship between asbestos exposure and malignancies of the gastrointestinal tract, pharynx/larynx, kidney, liver, pancreas, female reproductive system, and hematopoietic systems [1, 2]. However, one must bear in mind that in any population studied for asbestos exposure, cigarette smoking, alcohol consumption, and diet remain confounding variables. Also, the route of asbestos exposure, inhalation versus ingestion, has its own implications. Despite evidence both for and against, one cannot ignore the possibility that the carcinogenicity of asbestos may extend to sites of the body other than the lung and pleura to which the carcinogenic fibers can gain access. The pathologic features of these malignant neoplasms do not differ from those occurring in individuals not exposed to asbestos. Therefore, the role of the pathologist includes the accurate diagnosis of these diseases and also the examination of the lungs and pleural cavities for evidence of other asbestos-related tissue injury (see Chaps. 4 and 6).